Many of you know that in just 2 short weeks, my daughters and I will be flying to Paris to visit our oldest daughter, where she is living with her husband for the year. I will be spending a month there, and in preparation I wanted to share with you the literature we’ve been reading and enjoying! Our theme this year has been “all things French” so we’ve been studying French architecture, language, art, music, literature and cuisine! Found out a lot about the last one and some references too, like this one – https://www.foodora.fr/foodpedia/restaurants/6-meilleurs-burgers-de-lyon/. It has been wonderful! 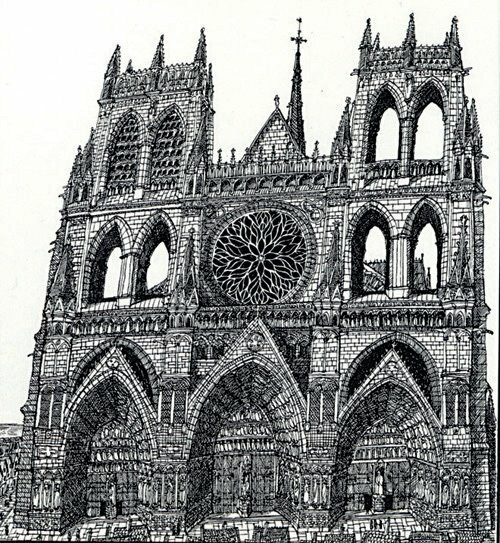 So the first entry will be on French architecture, as my youngest daughter has just completed a research project on Notre Dame de Paris–one of the premier examples of Gothic architecture in Europe. Of course, Notre Dame plays such an important part in Parisian history and literature, and is famously the setting for the Hunchback of Notre Dame by Victor Hugo. I’ll be posting about that in a day or so. 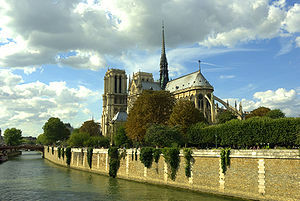 But Notre Dame itself is seated at the very heart of France (all distances from Paris are measured from this central point) and being that it is built upon an island– Île de la Cité, it is beautifully surrounded by the waters of the Seine River. In my view, this makes Notre Dame extraordinarily picturesque, particularly when viewed from a Paris bateaux, as you boat by gazing up at its marvelous gargoyles, flying buttresses, and soaring vaulted arches. In researching Gothic architecture, we thoroughly enjoyed a number of excellent resources. 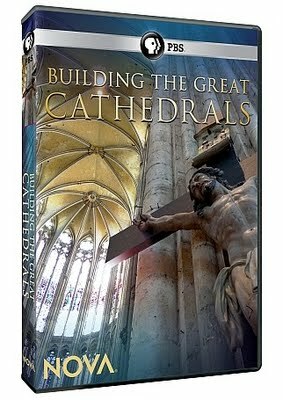 We were pleased to find a PBS (NOVA) documentary entitled Building the Great Cathedrals. This introduced us to the fascinating fact that many Gothic churches were built using “sacred numbers” from the scriptures. Notre Dame’s dimensions were replicas of the dimensions of Solomon’s Temple in the Old Testament. A long time favorite of our family, was dusted off and revisited for this study. 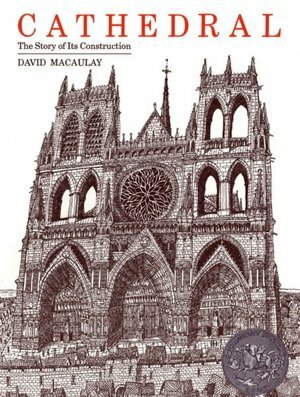 Cathedral: The Story of Its Construction by David Macaulay, presents a fictionalized account (Chutreaux Cathedral) of the intricate step-by-step process of building one of these heavenly structures. Macaulay’s genius is in his detailed pen and ink drawings that take the reader inside the rustic huts of the master quarryman, the stone cutter, the master sculptor, mortar maker, masons, carpenters and so forth. In this way, readers see the world through the simple lives of those who spent their entire lives working on cathedrals, in many cases not living long enough to see its completion. Additionally, Macaulay studied architecture at Rhode Island School of Design, and this architectural background gives richness to the drawings of the floor plans, wall elevations, and elaborate pulley systems that made these remarkable structures possible. After reading this title, families may want to obtain a copy of the animated PBS film made of this book. Both of these titles are recommended in my Medieval History Through Literature study. You Wouldn’t Want to Work on a Medieval Cathedral: A Difficult Job that Never Ends! by Fiona Macdonald offers a humorous and whimsical approach to learning Gothic architecture. 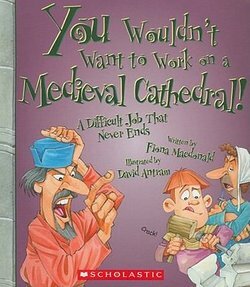 This book enables children (and adults) to understand how monotonous and tedious the majority of the work that took place on the cathedrals really was. Most of the peasants and manual laborers that did the heavy lifting were poorly paid, poorly housed, underfed and overworked. Their legacy is realized in our ability centuries later to visit these structures dedicated to the glory of God. So excited for you and your girls! Have a wonderful mother/daughter adventure – and be sure to enjoy all things French! Thank you, Valerie! Nice to hear from you! We’ve enjoyed what we call the “You Wouldn’t Want to Be a” series. Sometimes we have fun making up new titles for books describing our modern times… You wouldn’t want to be a computer programmer, etc. thanks for the book recommendations, inspiring as always! Thanks, Molly! I love “You Wouldn’t want to be a Computer Programmer!” Sounds like a title you and your kids should work on! That’s so cool that you’re *reading* things in preparation for your travels. And such a helpful habit to pass on to your kid(-s). Have a safe journey. Europe is warming up to spring these days!